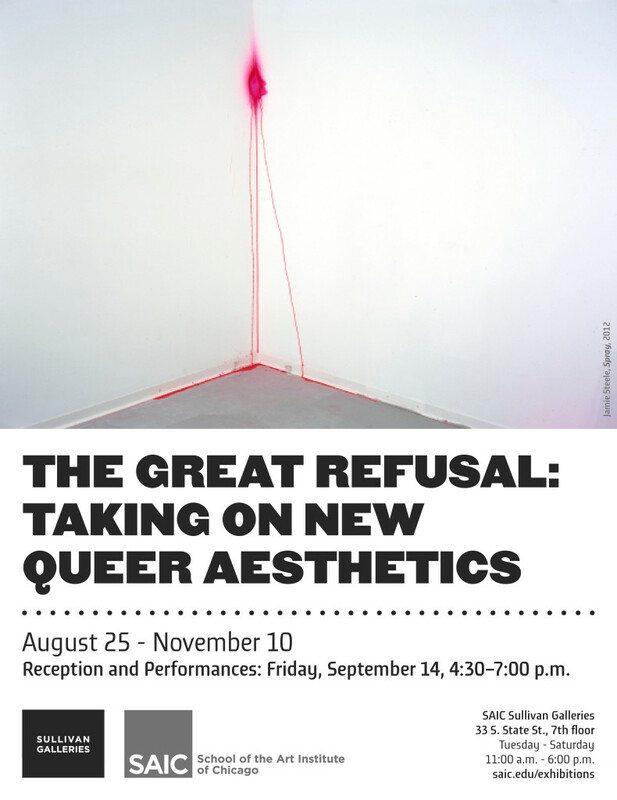 The Great Refusal: Taking on New Queer Aesthetics interrogates and explores the concept of queerness in this cultural moment through the work of over 50 contemporary artists. Through themes of Misuse and Dislocation, Restraint and Indulgence, Progressive Rituals, and Bad Values, this exhibition considers the term “queer” as it intersects with race, class, sexuality, and gender and suggests conceptualizations of what queer aesthetics could be. Curated by instructor Oliverio Rodriguez in collaboration with current SAIC undergraduates and recent alumni: Jordan Avery, Beatriz Aquino, Shandi Hass, Kiam-Marcelo Junio, Nicole Ricket, Jackie Rivas, Hannah Rodriguez, Ali Scott, Jannah Tate, Dana West, Sky White, and Nikki Woloshy. The exhibition will include a series of performances, film screenings, and panel discussions held at the Sullivan Galleries, as well as at cultural organizations throughout the city. Friday, September 14, 5:30 p.m.
Saturday, September 29, 1:00 p.m.
Friday, October 12, 5:15 p.m.
Saturday, October 27, 1:00 p.m.
Thursday, November 8, 5:15 p.m.